Gboard is Google's own keyboard app for iOS devices, and today the company announced that it's integrating Google Maps and YouTube directly within the keyboard. The two new features will be housed behind the "G" button on Gboard, now sitting alongside Google Search. With Google Maps in Gboard, users can share their location, or another location that they wish to serve as a rendezvous point, and send the address to a contact in Messages. YouTube lets users search and send any YouTube video to friends and family directly from Gboard. There's also a new "Ink" tab that lets users draw pieces of art to share with their contacts. 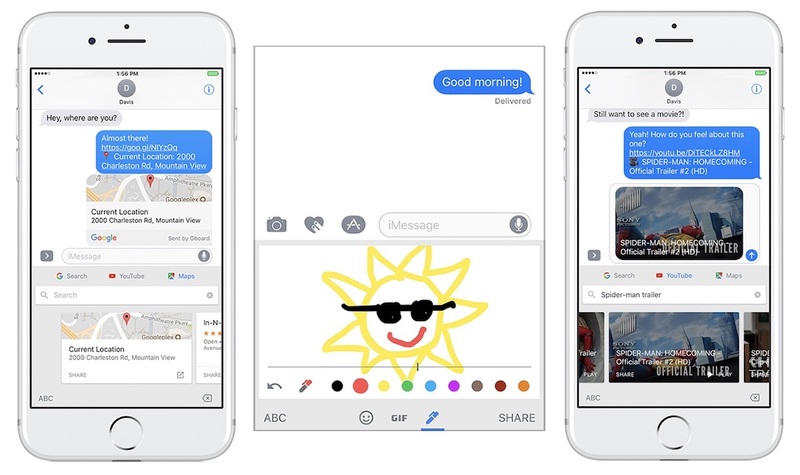 Outside of the Gboard app, Google also has a Google Maps app for Apple's Messages App Store, which lets users send their location to a friend as an iMessage. Gboard originally launched in May of 2016, with built-in Google search as its flagship feature, and was later updated with 3D Touch cursor tracking and voice support. Gboard is one of the main iOS keyboard apps that users can install as an additional keyboard to text with on their iPhone or iPad. Microsoft's SwiftKey is another well-known keyboard app for iOS, which the company has now decided to focus on after recently removing Word Flow from the iOS App Store. I use this all the time, just wish Apple would adopt swipe then I'd ditch this. Great, a keylogger for Googles datamining. Gboard is a game changer and superior to native iOS keyb in almost every way (other than no siri). Swype, once learned is a game changer. Searchable GIfs and emoji rock. Now with maps and YouTube and doodle it just got that much better. How is this keyboard different than the one built into the Google app? You use this keyboard system wide. Ya I like it as well but find swype a little trickier to be accurate on the smaller handsets (using a 5S at the moment) Plus my 5S has a little lag with it but it also lags with the standard ios keyboard at times so that's mostly just Phone getting to old/outdated syndrome.